As part of the campaign to commemorate the Ad Council’s 70th birthday, HelpGood developed a “Rosify Yourself” application that lives on the Ad Council’s Facebook page. Since 1942, the Ad Council has been creating memorable campaigns aimed at improving the lives of the American people. With the Facebook app, fans of the Ad Council can upload a photo of themselves and insert it into the iconic “Rosie the Riveter” poster, thus becoming riveters for social change. After fans have created their own Rosie the Riveter poster, they are able to share it to their wall on Facebook, save the image to their computer, and even print out a copy. The app already made an appearance on the Today Show with Matt Lauer and Ann Curry being Rosified. There was actually a real live Rosie on the Rockefeller Center plaza along with Smokey Bear and McGruff the Crime Dog. HelpGood designed and developed the app in Adobe Flash and integrated into the Ad Council Facebook page using Buddy Media’s iFrame sapplet. HelpGood also installed a Rosie themed page fangate which encourages people to like the page to get more exclusive content. You can find the full press release here. Not only is this partnership beneficial to help raise awareness for pet adoption, but Bud Light will pledge $1 to Tony La Russa’s Animal Rescue Foundation in Walnut Creek, CA for every new like on the Bud Light Facebook page. Speaking of shelter pets, HelpGood recently concluded our work for The Shelter Pet Project social media outreach efforts with outstanding results! It was ultimately an extremely successful campaign and we were happy to raise so much awareness for the cause. 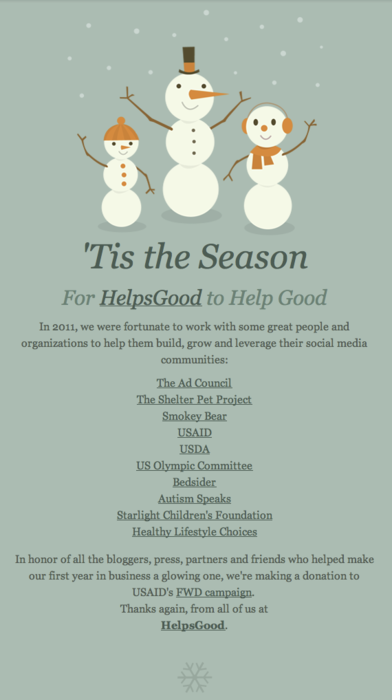 HelpGood focused on social media and blogger outreach and utilized in-house developed social listening tools to help track campaign analytics. With this campaign and the recent Bud Light commercial, we hope the number of animals being adopted from shelters hits an all time high! We built this blog-driven site for Whole Foods Market and their agency Omelet (http://wholefoodslovelocal.com/). The site emphasizes the company’s focus on natural and organic products and features stories and videos about local farmers who actually grow the food, focusing on their love and passion for what they do. Here at HelpGood we are in complete support of what Whole Foods does. Whole Foods supports their community by sourcing locally as much as possible. Rather than just donating to local community causes, it’s helping local, small businesses to flourish. Sustainable Connections says that when “you buy from an independent, locally owned business, rather than nationally owned businesses, significantly more of your money is used to make purchases from other local businesses, service providers and farms — continuing to strengthen the economic base of the community.” Shopping local also creates more jobs, gets you better service, and reduces the environmental impact! Recently HelpGood released a compilation video Stuff Smokey Says, a parody of the recent popular internet video meme. The “Sh*t ____ Say” meme has generated a ton of offshoot versions with many having some NSFW titles, content and language. The Smokey Bear version is decidedly very SFW though. This video features every version of Smokey Bear from all his PSAs over the years, from the very first 2D animated Smokey in black and white to the most recent CGI 3D Smokey. Video is a key component in the content mix when it comes to leveraging social media. Using video not only makes sharing your information more entertaining, but it creates a more intimate experience for the audience as well. Piggybacking on memes can also be a fun way to keep your brand participating in the conversation. HelpGood always looks to find engaging ways to grab attention and get them more involved in a campaign. YouTube videos are great because after viewing your content, people can share their thoughts and ideas with each other through the comments section, potentially roping in new folks to join the conversation. You create content hoping it will be consumed, embraced and shared by your fans. But what happens when the content you produce is shared by the “opposite side”? Recently much has been made of the Girl Scouts inclusive policy allowing transgendered children to participate. 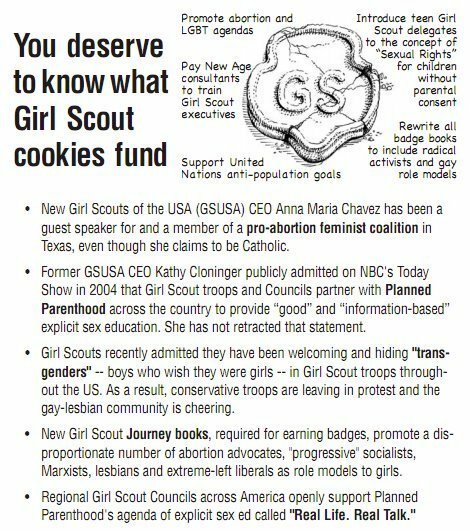 The policy inspired the (unfortunate) photo above from HonestGirlScouts.com and it inspired a well-spoken girl to speak not so well of the Girl Scouts in the video below. We’re in support of young women sharing their voices, but we’re not in support of discrimination. What we’ve found at HelpGood is that most of the sharers of the content have been from the opposite camp – the anti-target audience. The UGC pieces have had the exact opposite effect from the content creators’ intentions. The content sharers we’ve interacted with have doubled down in their support of the Girl Scouts and are committing to buy cookies in support of the standing policy of non-discrimination. It’s a compelling example of how any piece of user generated content can be co-opted by the other team to rally troops in defense. We at HelpGood can’t. If you’re a Girl Scout selling cookies – let us know, because we’re buying. And we’re buying what your organization stands for. Looks like they forgot the mommy and family bloggers but otherwise they got all the other (somewhat snarky) blogger categories. More and more crowdsourcing as a means of fundraising is becoming the norm. This is big news in the social media sphere – another nibbling at the heels of Facebook by Google Plus. Now search isn’t as aimless as before – there’s a quick and easy way to see what your friends recommend just by following the personal results.